Mac doesn't recognize My G-Nex?? I'm a mac user but I recently bought a G-nex, now I want to sync my music on my G-nex but the device doesn't show up on my Computer! Can somebody help me please? No drivers to download or install... just the file transfer app. You could also transfer items wirelessly with apps in the market if you have a wireless router. If you're tech savvy, look for an app called davdrive on the market. It will run a webdav server on your phone that you can connect to over wifi. One major limitation of the android file transfer utility is that the virtual server card is not available through finder. 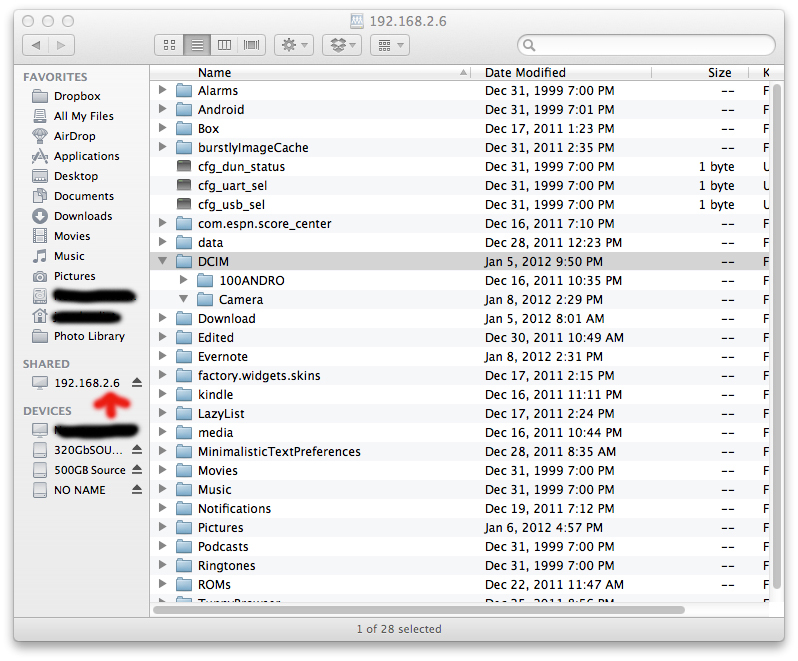 You need to manually copy files between finder and AFT utility. That also means no program can access the contents through it's File>open utility. (Say loading a photo into photoshop) You would need to launch AFT, copy the file to a location on your system, and then launch from there. Mounting the sd card as a webdav connection allows it to show up in finder, giving direct access from programs when browsing to a location. You can import photos into an library or editing utility without enabling PTP mode, also you can preview photos directly from the virtual SD card - AFT utility does not allow this. I walk into my house, turn on Davdrive (the paid version allows for always on), and I can access my SD card from any computer directly over Wifi, without plugging in a USB cable. (Windows I believe requires a DAV client, but Win 7 may have one built in - not sure). Mac it is as easy as selecting GO in finder, Connect to server, then inputing the info from the davdrive screen.